I constantly have people asking me how to keep their platinum hair bright and not yellow. I usually recommend a few of my favorite purple shampoos. 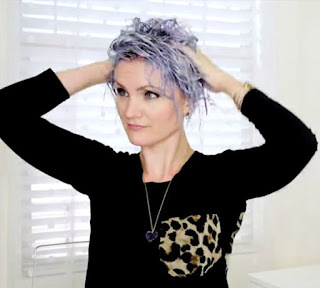 However I recently saw a video by WhippyCake on YouTube that showed a new way to use the purple shampoo that is more effective. It sounded good to me, and after having a platinum client test it I know that it really works! I am thrilled to share it with you now! Before I get to the step by step I am going to address some questions about this method. Why Does This Work Better? It does because when you apply the shampoo on wet hair the water has already filled the cuticle layer of your hair and it is harder for the shampoo to really penetrate the hair. Because there is no water in your hair the product isn't fighting and can really do it's job. What Purple Shampoo Should I Use? In the video she uses and recommends Naissant Perlabeige Shampoo and Conditioner. 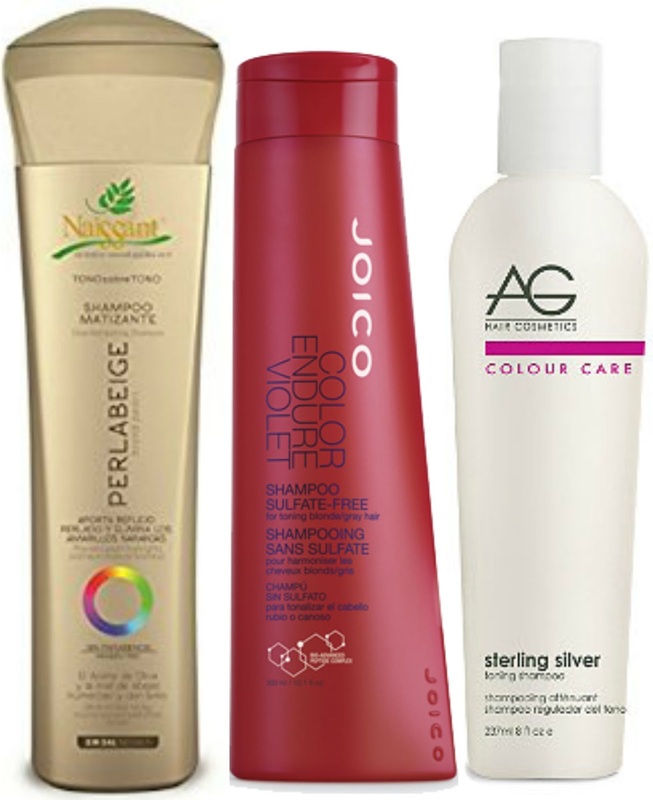 I personally love and recommend the shampoo and conditioner from Joico called Color Endure Violet as well as the Sterling Silver line by AG. 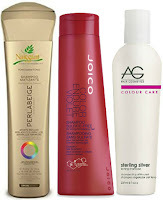 Joico also creates color deposit shampoos called Color Balance. These come in red, purple and blue. The blue is great for someone with more gold (orange) tones than yellow. If you see more yellow go with purple. This can be used with their red shampoo to help you make your red more vibrant. Do I Have To Do This Every Time I Wash My Hair? No. If you do you may start to see a purple tint, and if that is what you wants that if fine, but I recommend doing this once every week or two, just depending on when you start to see your color yellowing. Step 1 - Comb Your Dry HairThis will break up any product buildup and make your hair easier to work with. Step 2 - Section Your HairYou do not have to get super fancy with the sectioning. This is really just to help you be able to get your roots better and make sure you are really getting all the hair. You don't want to miss spots! 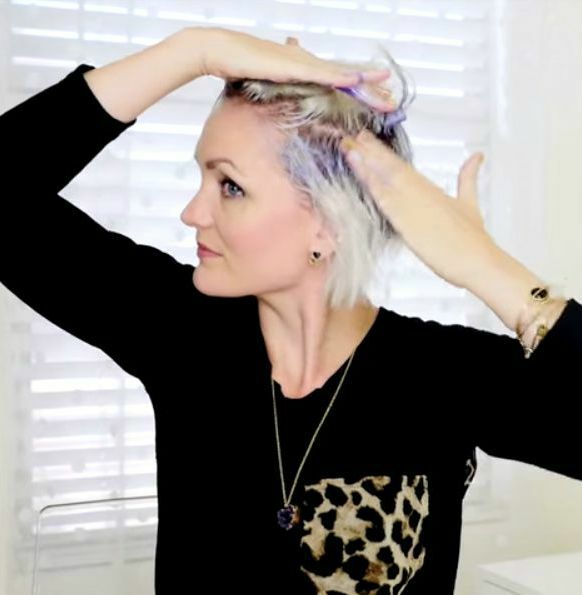 Step 3 - Apply Purple Shampoo on the Roots of your HairI recommend you start at the place that is the most resistant and that you feel tends to pull the most yellow. For most people this is the nape (or the back of their head near the neck). This is where she starts in the video as well. You will go through and apply the shampoo using your hands (you can use a brush but it is unnecessary) through your whole head. She doesn't say in the video how long she waited before doing step 4, but I would say wait about 5 minutes. Step 4 - Pull the Shampoo Through to the Ends of your HairThat's right, we are now going to use a lot more shampoo to cover the rest of your hair. It is true that this method uses more shampoo than using it in the shower, however it is also more effective. 5 - Wait 5-10 MinutesIn the video she waits for a "generous 10 minutes" and I recommend doing the same. My lovely client who tested this out yesterday also waited about 12 minutes and had great results. Obviously the more toning you need done the longer you will let it sit. 6 - Rinse and ConditionHop in the shower and rinse that shampoo out. Follow it with your favorite color protecting conditioner or mask, or the conditioner that is recommended to be used with the shampoo you used. Watch the video below! I loved watching WhippyCake! She is super cute and funny, and I felt like she didn't drone on and on forever! It was informative and I truly enjoyed watching her video. I'm stoked to try this! I think it's going to be cool with the blue shampoo by Joico you sold me on.